Around 7 percent of Americans over the age of 65 experience some form of heel pain, accounting for more than 1 million visits to physicians every year. Potential causes of heel pain range from localized injuries to consequences of systemic disease. Heel pain often emanates from the calcaneus, or heel bone. But the discomfort also could be related to heel tissue. As our post describes, there are a number of at-home treatments that may help resolve some types of heel pain. The heel of the foot is sometimes called the “hindfoot,” and people understandably think of it first as a bone, also called the calcaneus. But there are actually many different types of tissue that make up the heel. Disorders of any of these tissues and the structures they form can be a source of heel pain. Despite the fact that the heel is a relatively small part of the body, there are a wide variety of potential causes for heel pain, ranging from localized injuries to consequences of systemic disease. Here, we take a look at some of the most common reasons people experience heel pain, starting with the condition known as plantar fasciitis. The plantar fascia is a fibrous piece of tissue connecting the heel bone (calcaneus) to bones of the toes. It plays a critical role in the biomechanics of foot strike and foot push-off. Irritation and injury of the plantar fascia is the most common cause of heel pain among adults. Causes of plantar fasciitis include overuse through activities like running, prolonged standing, arch abnormalities (too high or too low), prolonged wearing of shoes with insufficient arch support, obesity, fibromyalgia, and inflammatory arthritides. As those who have experienced the condition can attest, the pain of plantar fasciitis is usually worst in the morning, when you’re taking your first few steps of the day, but it improves over the course of the day. Treatment involves icing, non-steroidal anti-inflammatory drugs (NSAIDs), and rest initially, followed by stretching and walking as symptoms improve. Some 90 percent of people with plantar fasciitis will improve within two months of starting a treatment regimen. In some cases, however, a steroid injection, a foot boot that keeps the foot flexed during sleep, or even surgery to release the tension in the fascia may be necessary. Plantar fasciitis, achilles tendonitis, and bursitis are just a few of the conditions that can cause significant heel pain. The Achilles tendon is formed by fibers of the calf muscles that insert onto the back of the calcaneus. Inflammation of this tendon often occurs after overuse of the calf muscles, particularly in athletes who run and jump frequently. Patients with Achilles tendonitis often have tenderness and swelling at the back of the heel, where the tendon inserts. It’s usually accompanied by pain when flexing the foot upward (dorsiflexion). Treatment involves NSAIDs, the use of orthotics, and physical therapy. There are two bursae in the heel: the retrocalcaneal bursa, which lies between the calcaneus and the Achilles tendon, and the retroachilles bursa, which lies between the Achilles tendon and the skin. Both can become inflamed and cause heel pain. The most common cause of inflammation of these bursae comes from ill-fitting shoes with a stiff edge that irritates the bursae. Less common causes of heel bursitis are rheumatoid arthritis (RA)—a disease in which the immune system attacks and damages the synovial lining of joints—and Achilles tendonitis. Treatment depends on the etiology, or set of causes, of the bursitis. A recent change in footwear could be to blame, as could NSAIDs you’re taking for bursitis caused by shoes. The space in the ankle region through which these branches pass is called the tarsal tunnel, and it’s formed by the calcaneus, another bone of the foot called the talus, and a fibrous band of tissue. 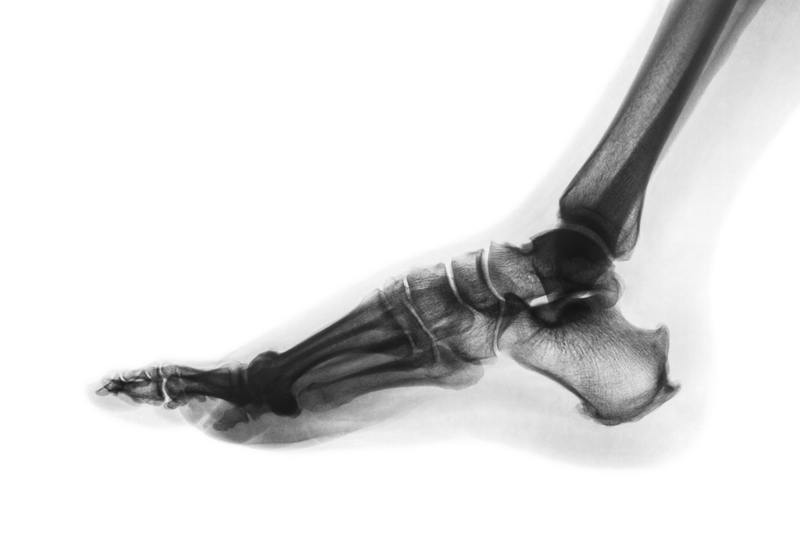 Damage to the branches of these nerves—often caused by compression and entrapment in this tunnel or from stretching of the nerves from collapse of the foot arch (“flatfoot”)—can cause numbness, pain, or tingling in the heel. Treatment options for nerve-related heel pain: Resting your affected foot, taking NSAIDs, and doing stretching exercises are the first line of treatment. Surgical decompression of the nerve may be necessary in rare cases. The heel pad, a shock-absorbing structure under the calcaneus, is composed of fat and fibrous tissue. A so-called “stone bruise” can occur when you step or land forcefully on a hard object, resulting in a painful bruise of the heel pad. Excessive pressure on the pad from obesity also can result in pain and soreness of the heel. The most often-prescribed treatments include rest and pain control with NSAIDs. Stress fractures of the calcaneus can cause heel pain and are most common in athletes who participate in sports that involve frequent running or jumping. Stress fractures also can occur in people with low bone density (osteopenia or osteoporosis) who are at increased risk for fractures in general. Treatment involves rest and, for some, non-weight-bearing assistance devices such as crutches, along with NSAIDs or other analgesics for pain control. Infection of bone (osteomyelitis) can occur in the calcaneus and is a rare cause of heel pain. It is more common in people with diabetes or peripheral vascular disease. Patients may have an open sore or wound on the foot in addition to redness, swelling, and occasionally systemic symptoms of infection such as fever. Treatment involves antibiotics. A variety of different systemic diseases can be sources of heel pain. Among them: rheumatoid arthritis and gout. Osteoarthritis, the most common form arthritis, rarely causes heel pain; it’s more likely to cause toe or midfoot pain. Rheumatoid arthritis can cause debilitating pain and ultimately structural deformities of the foot. More than 90 percent of people with RA will have symptoms in the foot over the course of the disease. Gout is a disease characterized by the build-up of uric acid crystals in joints causing intense pain and swelling. (See also “How Long Does Gout Last?“) While the big toe is the joint most often affected by gout, the heel can be affected as well. Therapy involves treating the underlying disease causing the pain. ankle pain, anti inflammatory, anti inflammatory drugs, antibiotics, arthritis, arthritis symptoms, bone, bone density, diabetes, fibromyalgia, gout, gout symptoms, heel pain, how long does gout last, immune system, infection, inflammation, low bone density, non steroidal anti inflammatory drugs, nsaids, obesity, osteoarthritis, osteopenia, osteoporosis, pain, people with diabetes, ra, rheumatoid, rheumatoid arthritis, rheumatoid arthritis symptoms, skin, sleep, stress, tendonitis treatment, uric acid, uric acid crystals, uric acid crystals in joints, vascular disease. I really didn’t know that there were that many types of pain you could get in your heel, I thought only a few. If I were to get any one of these, I would for sure go and see a foot doctor. As you mentioned in many of the types of pain that a doctor would be best to diagnose the condition and treat it. How could you prevent gout and can it be heel?